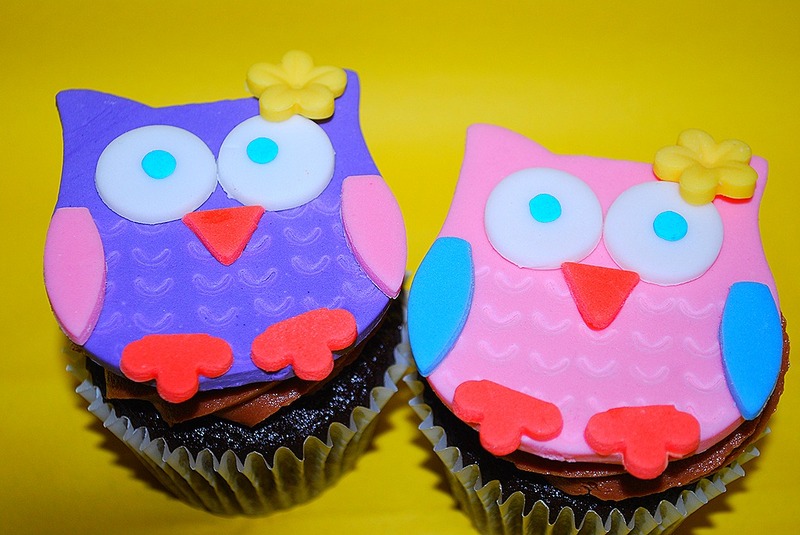 Whoooo wouldn’t love these cupcakes??!? I know that owls are still all over the place. While I have not jumped on the owl bandwagon, I was super happy that I got to make something with owls on it. I had an order a couple of weeks ago—I almost didn’t take it, but I figured I already had an order on Friday and two on Saturday, what was one more. She gave me a pic—I always like to have a pic to look at. I went from there and could not have been happier with the finished product! These were actually way easier than I thought they would be. The hardest part was figuring out the wings. 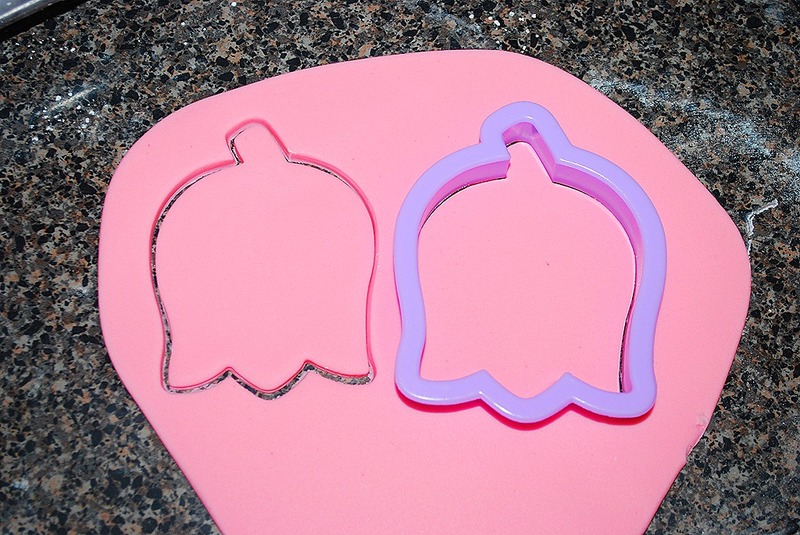 For the body, I used a tulip cutter. I cut off the middle point of the flower and the stem part with a knife. It made the perfect owl body. 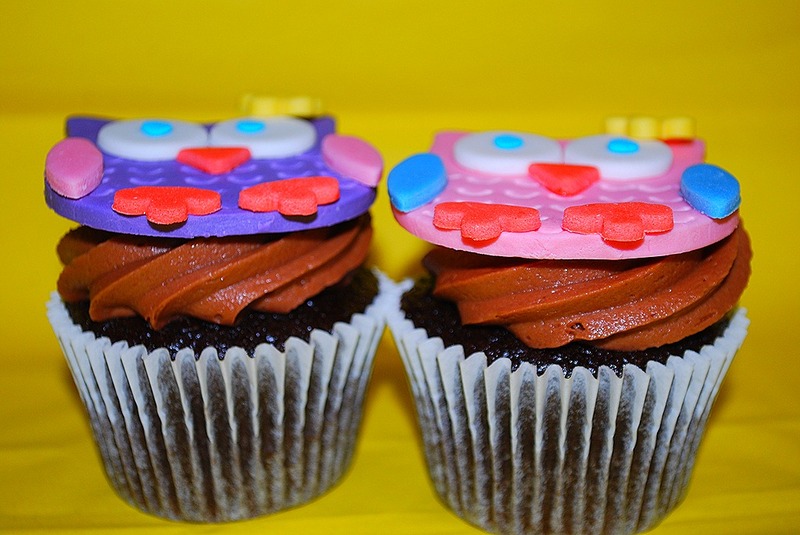 To give the body some texture, I used a frosting tip to make marks. The bodies had dried out over night, but were still soft enough to make the marks. Making these marks in the body gave the look of having feathers without having to add other pieces. 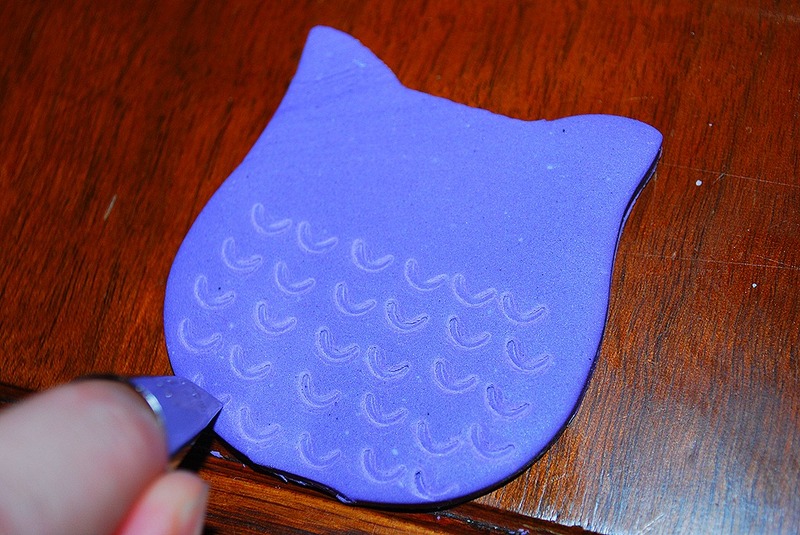 All of the little pieces for the owl were a tad bit time consuming, but easy to get done. I used a star cutter for the beaks—just cut the points off. I used one of my frosting tips for the eyes. The flowers for the ears were a medium blossom plunger cutter. 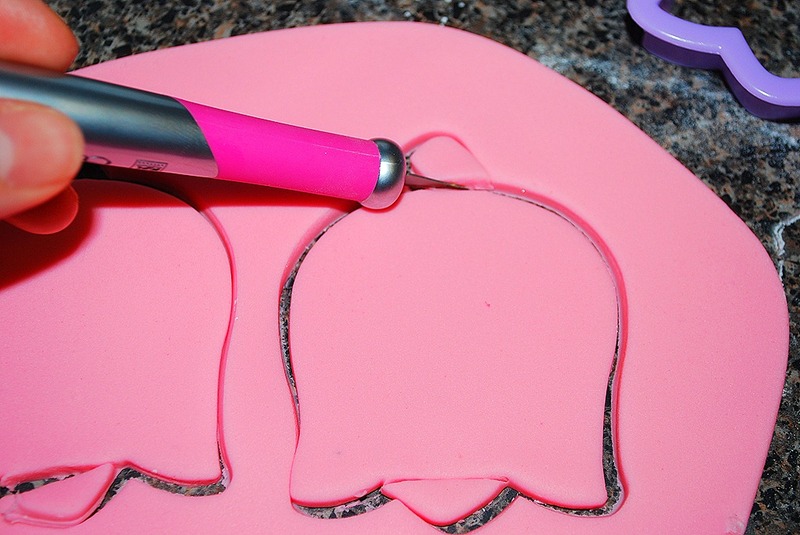 I also used that same cutter for the feet, but cut off two of the petals. The toughest part to figure out was the wings. I tried about five different kinds before I found the one I liked. 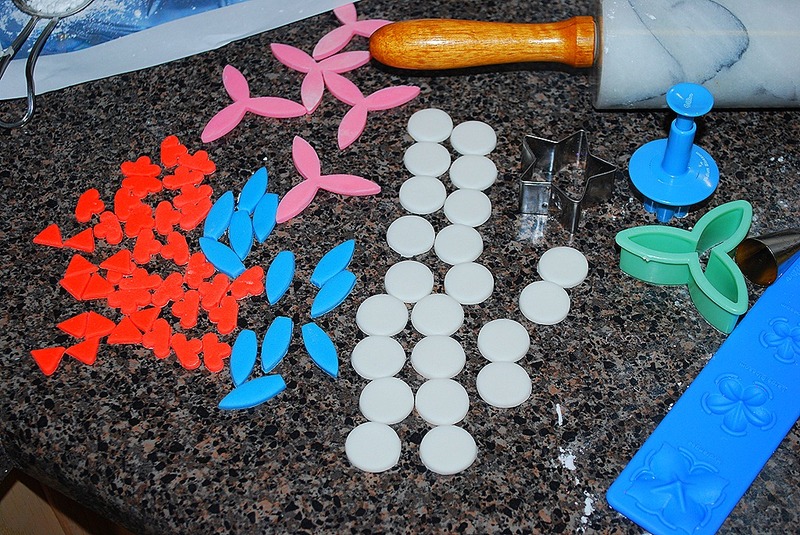 I did petal cutters, ovals, leaf cutters and finally found the three petal cutter. I have had that one forever and never used it—now I can!! 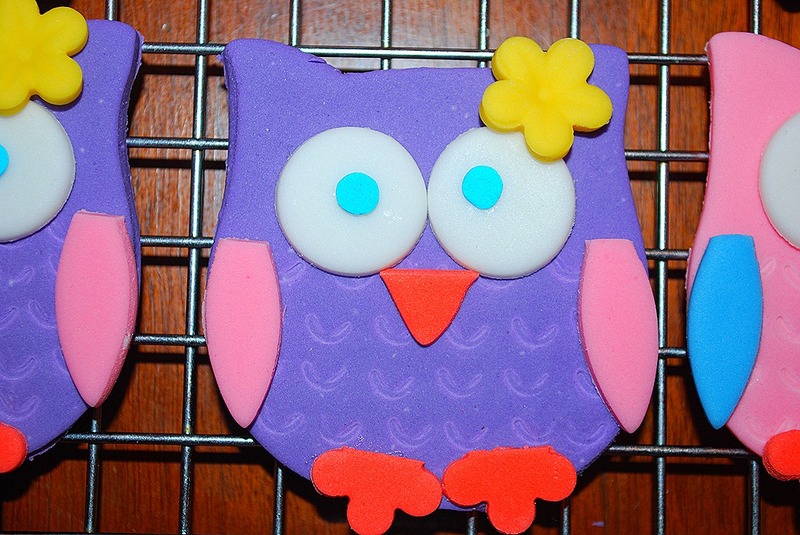 Just cut the petals apart, and you have some owl wings. Once everything was cut out, it was time to assemble. A little bit of water and the owls came together in no time. The body was made with a mix of gumpaste so they would dry hard. The rest was all fondant. I used a blue confetti piece for the center of the eye. The flower on top was the little added touch these needed to be done. 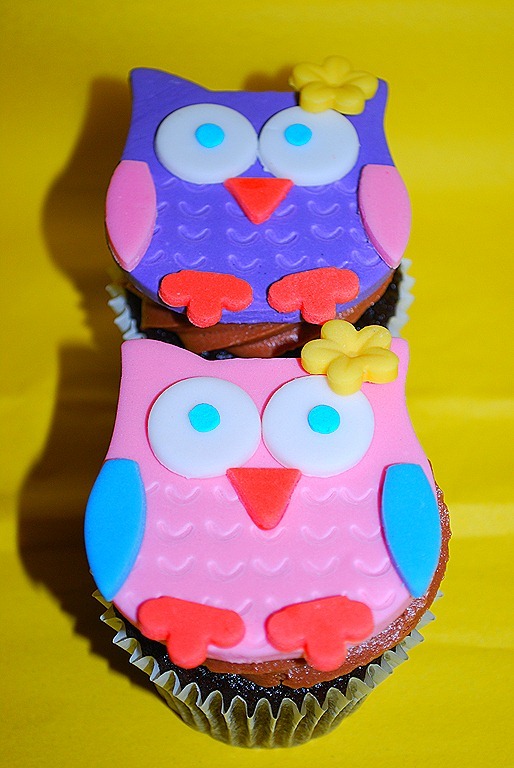 The owls went on top of the cupcakes and were ready for the party! These were easier than I thought they would be and just too cute. 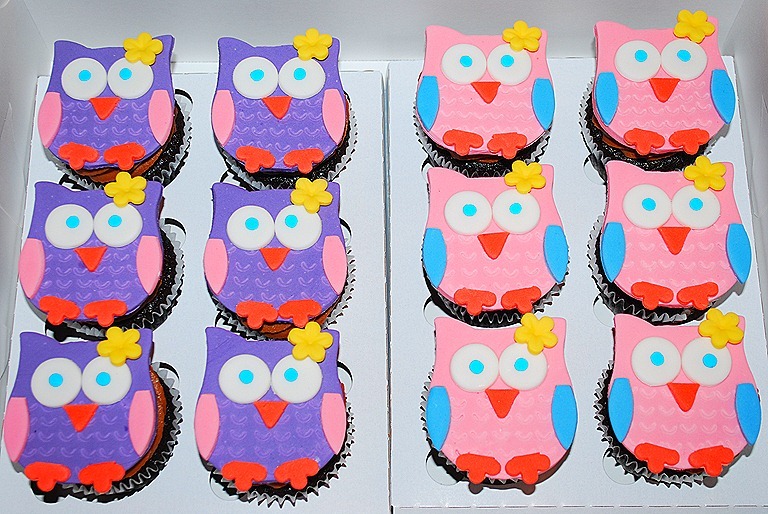 I so hope that I will get more orders for owl cupcakes and cakes. Enjoy!